Elinor Mair PritchardAn Anglesey student has begun a full-time post as a Translator for the Betsi Cadwaladr University Health Board at Ysbyty Gwynedd before graduating! Not only will Elinor Mair Pritchard, 21, of Rhosneigr graduate with a first class degree in Welsh this week, she has also won the Ellen Kent prize of £100 for her dissertation ‘Merched a Salwch Meddwl Mewn Nofelau Cymraeg’ (Women and Mental Illness in Welsh Novels). Elinor attended Ysgol y Graig before moving on to Ysgol Gyfun Llangefni where she studied the BAC, Welsh, Geography and Art at A level. 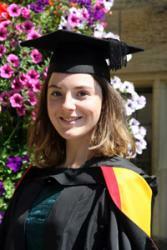 She won an Excellence Scholarship to study Welsh at Bangor University after sitting an exam in year 13. Elinor decided to come to Bangor following an open day, she explained: "The School of Welsh was very welcoming and I also love walking, so the fact that Bangor is so close to beaches and mountains appealed to me. "During my studies I had a graduate internship with the University during the end of my second year. I helped at the College of Arts and Humanities to promote the University’s resources and collections through a programme of events for local schools and the community during the summer. I also had an opportunity to create marketing materials to promote the new degree, Professional Welsh, which will begins this year. This was a very valuable experience where I learnt many useful skills for the future. "During my time as a student in Bangor, I was a member of UMCB (Bangor’s Welsh Students' Union), the Cheerleading Team, who competed in Telford and Birmingham; I was also a member of the Hill Walking Club. "It's a very nice feeling to be graduating. The last three years of hard work have flown by! I have been fortunate enough to find a full-time job before graduation and my future hopes are to continue to work hard and enjoy life."